Blogging 101 – Getting Started is a training module I’m teaching to communicators and dairy farmers. It’s all about getting started with a blog as your mainstay on the internet. I’ve given the reasons of why you should blog but here are 13 steps to help you on your journey. And as always, you can reach out directly if you need help. Just hit up here or here and I’ll try to get you an answer or find you someone who can help. You need to figure who you want to be in your professional and personal life. I don’t think these things are separated in this digital age we live in and if you are going to have a digital life and brand then the two need to live together. Mainly because it’s really hard to separate the two and secondly, if you are only going to be a professional and remove the personal, no one is going to find you interesting. We are humans and humans are social and personal – not robots. You can focus on your profession for your blog but if you never tie in personal stories, it’s just not going to resonate with the audience. Do you need help figuring out how to write out a personal brand statement? – check my post on it. It’s super simple yet will help you in profound ways. Write out your first three or four blog posts in whatever system you prefer. Definitely DON’T write a post in the system – directly on the internet. It only takes a few lost posts before you will switch to just writing in evernote (which I love) or in notepad or text-edit. Find pictures / video content to associate with your blog and add them to it. Don’t steal or just grab stuff off the internet. You need to give credit where credit is due. I usually look through free image galleries or get images from Flickr.com/creativecommons – you have to give attribution and don’t photoshop their stuff unless they tell you it’s ok. Think long and hard about your domain name (keywords in the URL are important). Having a your own domain name (with personal blogs, I suggest using your name) with good keywords in the URL. If you are writing about professional stuff, then make sure your professional terms are in the name. You can use godaddy.com or other providers to get your name. 5. Select Your Technology – for the future. If you get a very simple system, you may grow out of it. Pick something you think will be best for you in the future. If you are not tech savvy at all – try tumblr.com. If you are a little more tech savvy and want more control – blogger, wix, squarespace or wordpress.com. Want a lot of control – wordpress.org but be prepared to do a lot of work (you might need to learn how to code a few things like w3schools.com) or pay programmers to help you. 6. WHAT’S YOUR CALL TO ACTION! What do you want the audience to do? Yes, read your post is why they are here – what’s their next step? Get their email address? Connect to you via social media? Sign a petition? Spread the word? 7. Are you a designer? This is definitely not something to DIY. Hire a professional to make you look good. It’ll be worth it in the end. Use notepad or textedit to remove code. Learn about categories and tags. Take your time, work out the bugs, you can have a deadline but don’t force it out. 9. Add your other content. You need an About page and your CALL TO ACTION page. Set those up. Add your social media profile links. Add your fun widgets. Don’t distract people too much. Everything has a purpose. 10. Get on a schedule. Make and schedule your editorial calendar. One post a week is hard to do but will probably get you the most bang for the buck. Stay consistent. I need to follow my own advice here. Don’t forget to link your blog to all of your social media profiles and email profile. This will help drive traffic. 12. Analytics helps you adjusted. What should you post next? What are people actually reading? Why am I still blogging? Get Google Analytics (free) set up on your website to insure you understand what your traffic is doing and what they like about your website. 13. Use your network to drive traffic. After posts, make sure you are posting your links to all your social media contacts. Did I mention others and link to them? Read other blogs and comment on them. So are you ready to get blogging? What are your steps to set up? Anything I missed that you think I should add? Why blog? Because It Works. 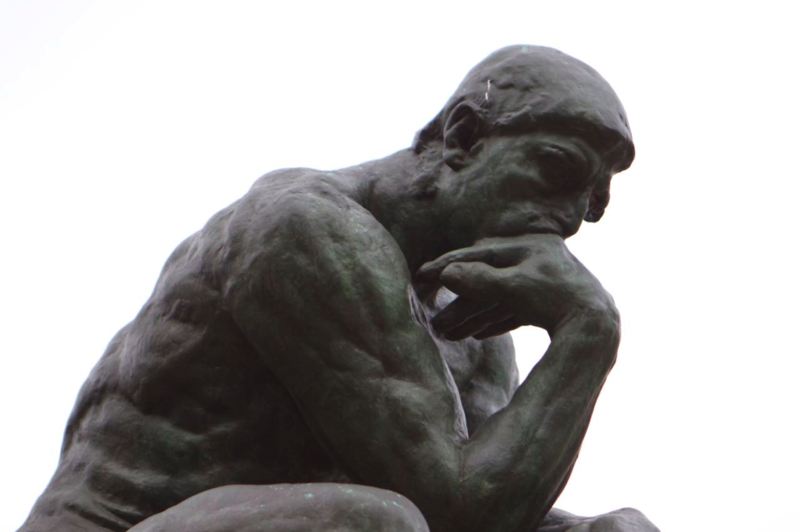 The Thinker – I’m sure he would have blogged, too. You want to help people find the information they are looking for. You want to gain knowledge from others. You want to connect people to other people. You want two-way communication and feedback. But what else happens when you blog? Google and the other search engines start indexing your content. People start responding to what you writing. People start trusting what you are writing. People call you an expert. Search engines start putting your information at the top of their search pages for keywords. Suddenly you are internet famous. Why would you blog? Did I miss your reason?